Little in the national Storm Prediction Center’s summary of U.S. tornado activity through April suggested Oklahoma was about to suffer a tornado assault. Every year, thousands of tornadoes develop in Oklahoma, the vast majority causing no deaths, injuries or damage to structures or crops. But according to the National Climatic Data Center, from 1991 to 2010 Oklahoma had one of the the highest rates of tornadoes rated EF3 through EF5. Oklahoma’s rate was 0.4 per 10,000 square miles, which tied with Kansas and Mississippi. Arkansas had the highest, at 0.5. The interactive map below locates the touchdown point of every tornado in the state from 1990 to 2013, through May 20. Some tornadoes traveled short distances, others many miles. Each dot is colored according to EF level; the larger its size, the greater the number of fatalities. 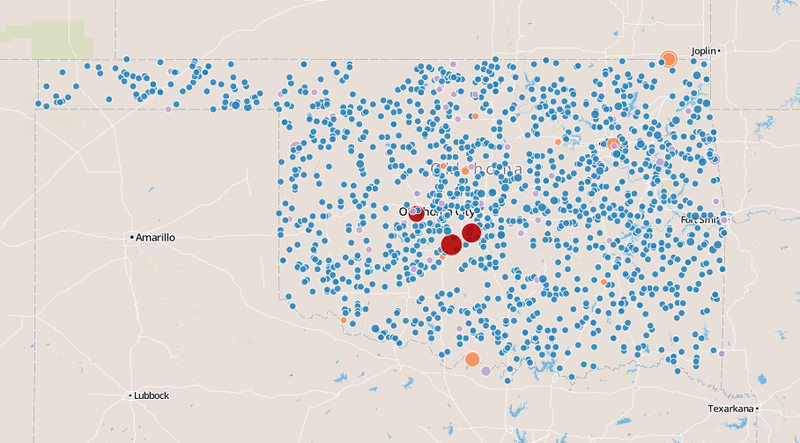 Click on a dot to see details about each tornado. A chart showing all tornadoes year by year is below the map. The Enhanced Fujita scale, which rates the strength of tornadoes, runs from 0 to 5. Before 2007, a similar Fujita scale was used.